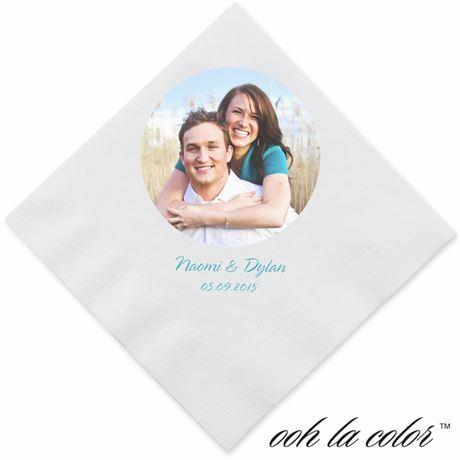 Bring a personal touch to your reception with these Ooh La Color® napkins, perfect for coordinating with your photo wedding invitations. The soft, three-ply patent pending dinner napkins come with your choice of photo printed as shown and your choice of typestyle and imprint color for your wording. Photo wedding napkins are an easy way to add a custom element to your reception. Napkins ship separately. What a great way to pick up a theme! The themed napkins were used when we served the wedding cake. Our invitations, thank you cards, and candy wrappers had the same picture and we had the cake topper that also matched. The napkins were well printed and were sturdy. 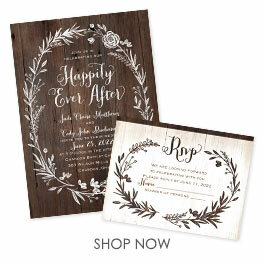 I would recommend Ann's Bridal Bargains to anyone getting married or having a party!